In 1977, the worlds of sport and art were combined by Warhol's Pop art colors, creating his 'Athletes' series. Warhol reimagined athletes Pelé, O.J. Simpson, Kareem Abdul-Jabbar and Jack Nicklaus through his Pop-art spectacles following a commission from modern art collector, former investment banker and sports fan Richard Weisman. American painter Neiman was well known for his artworks depicting athletes and sporting events. The tale of the athlete series took an unexpected turn in 2009 when the 11 large silkscreen portraits were stolen from Weisman's Los Angeles home. In the beginning of September, Mr Weisman's cleaner noticed the portraits had been removed from above the dining room table. In a curious twist, all other art in the house remained untouched with no sign of forced entry. 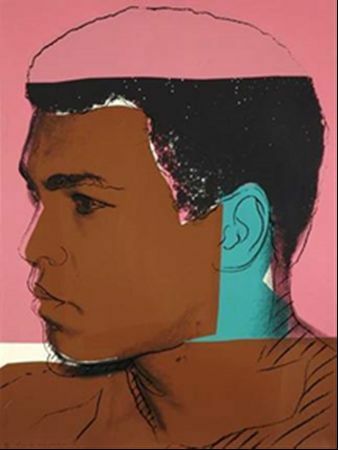 Weisman explained to The Los Angeles Times "I commissioned him [Warhol] to do this set of athletes because, generally speaking, the worlds of art and sports don't mesh that well." In 2011 in Christie's Post-War and Contemporary Art Evening Sale in New York, The Complete Athletes Series sold for £4 661 990. Search realised prices for Andy Warhol here. The series included the aforementioned athletes as well as figure skater Dorothy Hamill, who inscribed the portrait 'Love, Dorothy Hamill', Canadian ice hockey player Rod Gilbert, New York Mets' Tom Seaver, world-record jockey Willie Shoemaker and tennis ace Chris Evert. Not all of Warhol's athletes sell for the big bucks, last week a screen print signed in brown felt-tip pen and numbered with the inkstamp of the publisher edition of 113 of 150 was sold at Catawiki for under £10 000. A great example of an entry piece for budding Warhol collectors, the piece was purchased in 1986 at US Galerie Barbara Farber.